Hands are the most used parts of our bodies. They are used from typing, cooking, scrubbing dishes to writing documents and giving hi-fives, driving and styling our hair, and practically everything else! Yet they are often the least cared-for body parts while we spend a lot of money on our face and hair-care etc. Our hands go through a lot on a daily basis and still care for our hands, more often than not, falls on the bottom of our list of beauty priorities. But did you know, hands show the first signs of ageing, even before our face? Rough, dried hands, chappy nails, dark spots, veins and loose skin on your hands are no pretty sight; and also they give away your age earlier than your face. So, it's really high time we start caring for our hands and showing them some love with a regular care regime. With busy lifestyle, it's often easy to ignore our personal care, let alone caring for our hands. I had faced the issue of having dried hands, peeling off cuticles and chapped nails for a very long time and it was almost impossible to take care of hands everyday. I tried some hand creams which gave nice results but are so expensive if I were to use them every single day so I ended up skipping them many times. And then I decided to use something that would keep my hands soft and supple, without splurging a lot of money. With all of this, I was also short of time to experiment making a cream or a lotion from scratch. 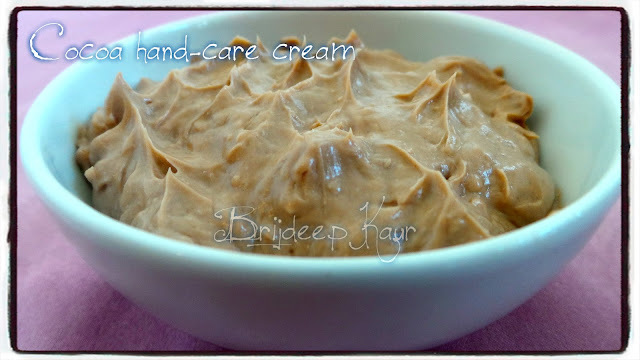 So I used a regular, basic, flavorless and odorless cheap body butter cream from my local store and converted it into a nourishing hand cream. With the use of this cream in just 15 days, my hands have become softer, cuticles are no longer dry and the nails are getting healthier. 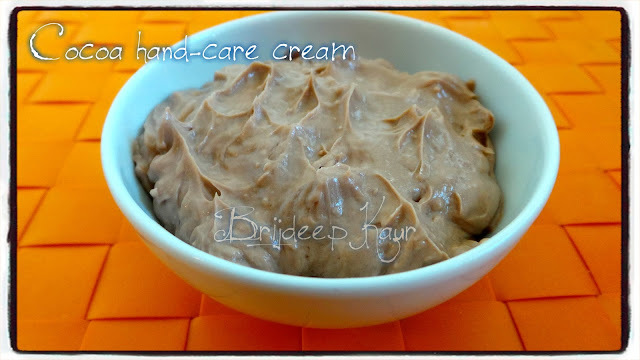 Take out the body butter cream in a bowl. Warm the olive oil and coconut oil in microwave for a minute each, in separate bowls. Add both the oils to the body butter and mix nicely to incorporate the oils completely in the cream. Add the glycerin and lemon juice. Mix nicely again. Add the cocoa powder and mix everything vigorously so there are no lumps remaining of cocoa powder. Warm everything again in a double boiler till it's just warm but not hot and bubbling. Let cool completely and transfer this cream to a box with a tight lid. 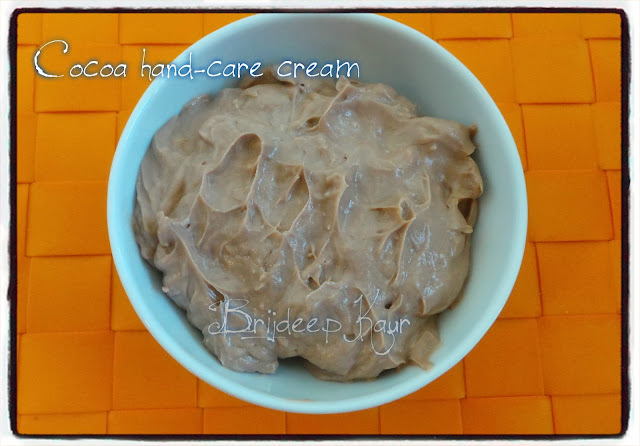 Any old and clean cream box would be ideal to store this hand cream. Use every night before going to bed. It will help keep your hands, nails and cuticles soft and supple and delay ageing. How each ingredient helps for the skin of hands? Olive oil: Olive oil contains omega-6 and omega-3 fatty acids, which keeps your skin smooth and soft to touch. It is filled with vitamin E which is a famous antioxidant. It prevents oxidation in skin cells so the skin looks much younger and less wrinkles appear on the skin surface. It will make your hands baby soft and smooth. Coconut oil: Coconut oil is naturally antibacterial and anti-fungal, it's a natural moisturizer and can penetrate our skin better than other oils. Glycerin: Glycerin is a humectant, which means it attracts water. When applied to the skin, it seals in moisture that might otherwise escape. That is why it helps combat dry skin. It helps keep the skin more hydrated and the hands won't look dry and scaly with the use of glycerin. Lemon juice: Lemon juice has antibacterial properties and it is used to avoid darkening of skin of hands and it also helps in keeping the skin shining and glowing. It also helps reduce acne and dark spots on the hands. It even moisturizes and tones, and fights wrinkles. Use this regularly for best results on hands and nails. Please don't use if you are allergic to any of the products. Please do leave a comment/feedback in the comments section below if you liked this. You can join me on Facebook for my regular updates.